First, consider the kind of pet that suits your family best. The truth is most people want a cat or dog. Whatever your preference is, from the minute you bring it home, your pet becomes another member of the family and you consider their best interest in every important decision the family makes. If you end up with a dog, consider a move to a pet-friendly neighbourhood that offers you the same amenities as a downtown residence. Choosing the right residential community for your family and pets can be a challenge. Luckily, the Shorooq community in Mirdif By Dubai Asset Management is family friendly and pet-friendly. Smaller animals such as cats or lapdogs are excellent choices for hassle-free pet owning in the city. Cats don't have to be walked; while small dogs can be trained to go on wee-wee pads and don't require a huge area to run free. They are happy with a leash walk around the block, provided your neighbourhood allows it, which Shorooq does. If you absolutely love big dogs and are willing to put in some effort, then go with your heart. Just be prepared to get in the car and drive to the marina or one of the rare areas that allow you to exercise the more active dog in public. You also need to find a community that welcomes large pets. 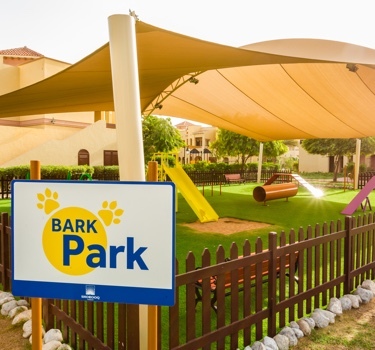 Shorooq in Mirdif not only embraces families with pets, but also provides a large dog park where your puppy can socialise with its four-legged neighbours and run off some energy. If you live in or plan to move to the downtown area, you soon find that the majority of Downtown Dubai doesn't offer walking space for larger dogs, and walking smaller pups is also restricted. The best option is to choose a smaller dog and look into finding a landlord that welcomes them. The Shorooq community is one you should visit for a warm welcome to residents and their lovable pets. Located in Mirdif, the popular family-friendly area, Shorooq features lovely, upscale homes yet retains the feel of a more intimate neighbourhood. Even before you start to tour Shorooq, you sense the warmth and cohesion of the neighbourhood. There's an inimitable town-within-a-city vibe, created by large open spaces filled with meticulously landscaped greenery, inviting playgrounds full of happy children and outdoor sporting courts for active residents. Shorooq is also located nearby a number of prestigious schools, vet clinics, and healthcare facilities, as well as shopping and entertainment outlets including City Centre Mirdif, Dubai Festival City, and City Centre Deira. Select from studio apartments to 4-bedroom villas that meet the needs of your family. You also have access to the city via the Rashidiya Metro Station that's adjacent to Shorooq. Pet enthusiasts are impressed with Shorooq's unique dog park. Dogs roam freely and entertain themselves and bring laughs to families with their antics. So if you are planning a move, this could well be the perfect community for you.